ROYGBIV is a game about oral communication. Each player is handed a card that is covered in symbols. One of the symbols on each card is defined. Without showing the cards to one another, the players must decode the message on their personal card and complete the required action, which is to change the color of a particular box on the screen. Pete Vigeant is a game, media and experience designer that creates large group live-action and digital interactive experiences. 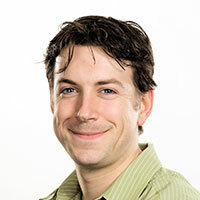 As a Senior Designer for ESI Design, Pete Vigeant draws upon his passion and expertise in game and youth-focused design to lead and develop interaction, media, concept, and game design for numerous ESI projects including Eddie’s Social Committee and the Edward M. Kennedy Institute for the Senate. Pete also leads the ESI Game Lab where he has created and launched a series of immersive live-action group experiences to promote collaboration through play, spectacle, and narrative gameplay. He has introduced ESI Game Lab experiences such as Super Bacon Grab 2, the Greatest Bacon Game Ever Played: The Return of the Bacon, Field Frogger, The 100 Games Everyone Should Play, and Field TD in public spaces, city wide festivals, and conferences around the country and the world. Pete is a founding partner of The Completely Surrounded, a consulting group that has worked with camps, colleges and institutions to bring live action games and training to thousands of participants.